To find the iconic locations that inspired the Group of Seven, Canada's beloved landscape artists, scroll through, using the arrow to the right. Explore and discover your own inspiration using these Group of Seven Discovery Routes. The sheer breadth of paintings and sketches by the Group of Seven, located inside the walls of Ontario galleries is nothing short of spectacular. Visit 18 public and private art galleries across the province. Location: Mazinaw Rock, Bon Echo Provincial Park. Painting credit: Arthur Lismer The Big Rock, Bon Echo, 1922, National Gallery of Canada, Ottawa. The Group of Seven was a collective group of Canadian artists who captured the raw, rugged beauty of Canada through their landscape paintings. Their artistic style became a distinct and globally recognized contribution in Canadian art history, but their journey didn’t end there. The story is as relevant today, as the day they took their first step into the remote Canadian wilderness. The members of the Group of Seven were searching for inspiration, reflection, and collective consciousness between themselves and the land beneath their feet. Use the Group of Seven Discovery Routes, to build your own inspired moments. These six themed itineraries will allow you to connect the paintings on the walls, with the landscapes on the ground. During your travels create a sketch, a poem, a photograph, a story, a memory. 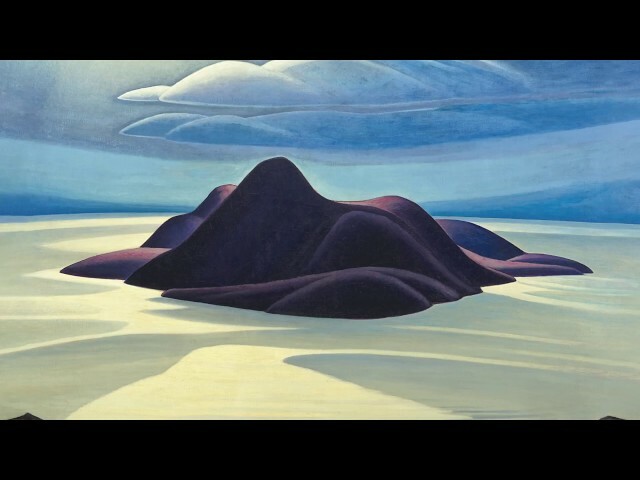 Feel what they felt and continue the Group of Seven’s journey. Visit 18 public and private art galleries across the province including Art Gallery of Windsor, McMaster Museum of Art, McMichael Canadian Art Collection, Art Gallery of Algoma, and the National Gallery of Canada. Connect art on the walls to the landscapes on the ground by using all 6 Group of Seven Discovery Routes. The landscapes in Algoma and the North Shore of Lake Superior are nothing less than inspirational as evident by the sheer number of works created by the Group along its coastlines and rolling hills. Wind and twist your way up the Trans-Canada highway as you hug the Huron and Lake Superior shores, stopping at Group of Seven themed interpretive installations. Hop aboard the Agawa Canyon Tour Train ,and ride the same route the Group of Seven took. Art has the power to change. Evident in La Cloche, Sudbury and Cobalt, the Group of Seven put a face to the impacts of industrial development on the landscape and used it to influence change. See what they saw while hiking the white quartz hillside of the La Cloche Mountain range, explore historic mining towns, take a guided gallery tour or paddle lakes named after Group of Seven members. This is Tom country. Tom Thomson passed away before the Group of Seven formed but had a profound impact on each of the group members. It is said that Thomson gave the Group of Seven the courage to explore deep into the Canadian wilderness. Explore Algonquin Park, the backbone of most Group of Seven works from this region. Enjoy a twisty autumn drive to find ninety Group of Seven inspired mural replicas throughout the region. Book a guided Group of Seven themed canoe trip, painting or photography workshop. Art has played a significant role in defining Canada, and the nation’s capital is brimming with works and stories throughout the city. Head indoors to view iconic and globally significant paintings and sketches created by the Group of Seven and find unique pairings with Canadian contemporary and Indigenous artists from across the country. Explore the surrounding Ottawa Valley region which showcases communities where members of the group lived, hiked trails, and paddled lakes. The Group of Seven painted more than remote landscapes. City architecture and their commercial art lives (and even deaths) are interwoven into the Greater Toronto Area. Find a hidden glass mosaic created by a member of the Group of Seven, view commissioned murals in churches and schools and locate the historic building used by multiple members as their studio space. Explore Tom Thomson and the Group of Seven works at both the Art Gallery of Ontario and the McMichael Canadian Art Collection. Discover the art of the Group of Seven in a one-a-kind setting situated amidst 100 acres of serene land and housed in a sprawling complex of intimate galleries and exhibition halls built of fieldstone and hand-hewn logs. Floor-to-ceiling windows enable gallery-goers to take in marvellous views of the densely wooded Humber River Valley as they enter and exit the gallery spaces. The McMichael, is truly an extraordinary place to visit, where connections between art and nature can be explored. See the most important collection of works by the Group of Seven at the National Gallery of Canada. Sketches paired with the finished works and murals from the cottage of patron James MacCallum are featured in the new Canadian and Indigenous galleries. Outside, the Taiga Garden is inspired by A.Y. Jackson’s painting Terre Sauvage. Discover how the Group fits into the story of Canadian art at this top attraction in the heart of Canada’s capital.